When the Japanese turned their attention away from China, these brave men were given a choice. They could go back to their commissions in the Navy or Marine Corps, or they could join the Chinese air force. Some of the men choose to follow Chennault. Others went back to their commissions in the Navy and Marine Corps. In the end the AVG was replaced by the 14th Army Air Corp/Air Force Flying Tigers. The 14th Air Force served in China from March 1943 - December 1945. 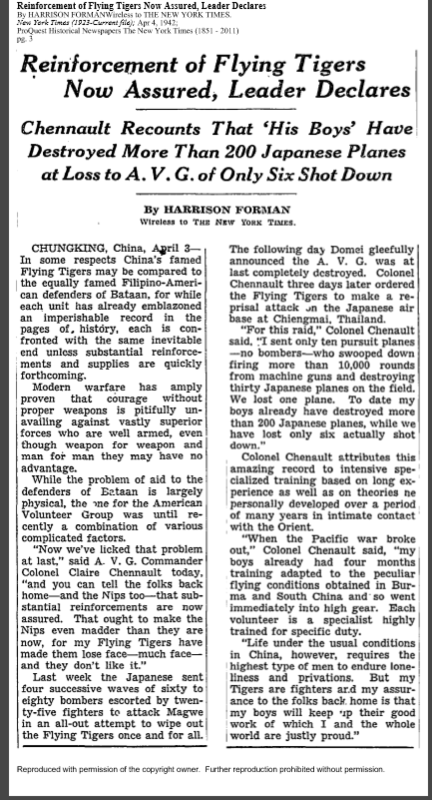 "When he [Chennault] got to China, and saw what the Japanese were doing to the Chinese people he had such great compassion for the Chinese people. He developed very quickly an appreciation for their culture and their nature and he really knew that he couldn’t leave. It was something that he had to do. I think that is something you don’t read in the history books or online. He really had a passion for the Chinese people." ​"They see him as savior, because he came to their aid before Pearl Harbor, before the United States starting siding with the Chinese, against the Japanese. But before 1940, the US was supplying Japan with their industrial products, oil and gas. He was a man willing to stand up to his own country and come their aid. They don’t forget that and they appreciate their history."